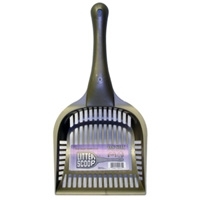 Gone are the days of tearing litter box liners with your litter scoop! 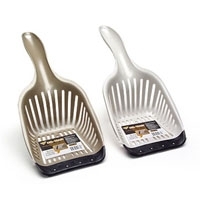 The No Tear™ Litter Scoop features a wide scoop that requires less passes through the litter to clean the box and a rubber strip to prevent tearing of the liner. Cut-out holes allow for clean litter to pass through, trapping dirty litter for disposal. Available in Pearl White. 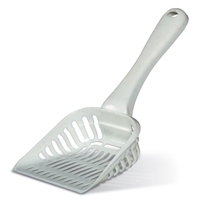 Ideal litter scoop for owners of large sized cat pans. Made from high impact plastic for extra durability. High polished finish that is odor & stain resistant & easy to clean. 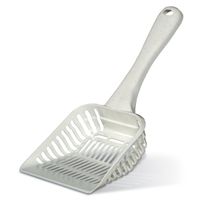 Ideal litter scoop for owners of single cat pans. Made from high impact plastic for extra durability. High polished finish that is odor & stain resistant & easy to clean. 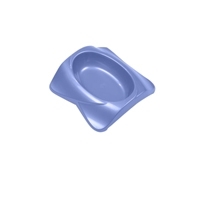 The Van Ness Heavyweight Cat Dish is USFDA food contact approved plastic, which makes it safe for your pet. 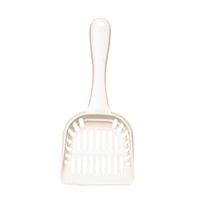 This dish features non-skid rubber feet, a durable design and is dishwasher-safe, which makes cleaning a breeze. Petmate’s basic litter scoop features an extra wide mouth and large slits for sifting dirty litter out of your litter box. Pointed tips and corners help trap hard to reach waste. Available in a variety of colors. Giant size. Petmate’s basic litter scoop features an extra wide mouth and large slits for sifting dirty litter out of your litter box. Pointed tips and corners help trap hard to reach waste. Available in a variety of colors. Jumbo size. Petmate’s basic litter scoop features an extra wide mouth and large slits for sifting dirty litter out of your litter box. 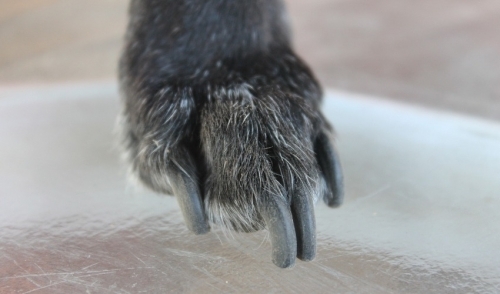 Pointed tips and corners help trap hard to reach waste. Available in a variety of colors. Large size. 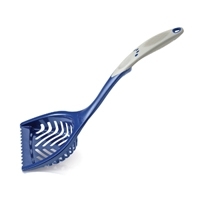 Petmate’s Ultimate Litter Scoop makes cleaning your litter box simple and easy. 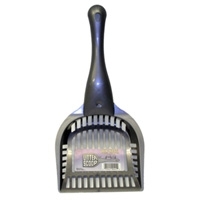 The extra-long handle makes for less bending and features a comfortable, rubber grip. Rounded corners easily clean hard to reach corners and the large slits allow clean litter to sift through while containing dirty litter for disposal. Available in black or peacock blue, one size.